Audion Sterling Plus Anniversary stereo is hard wired point to point using better graded components and & larger Audion wound output transformers (EI96) hand built. 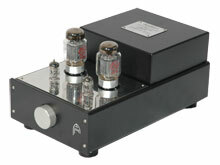 This pentode based KT88 stereo amp uses a small amount of feedback in the design. The chassis is black powder coated aluminum as is the transformer cover. The top plate and badge are mirror finished stainless steel. This Sterling is suited for use with loudspeakers of 87db or better efficiency. Ideally matched with our range of Proton cables. 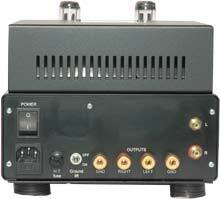 The amp delivers 18 watts into 8 ohms. Options are available for this model, see upgrade options at end. The Sterling is built with components sourced from Europe and the US. Where possible we avoid the use of any Chinese component. Our output transformers are wound in-house to our exacting standards and many of the components are either made by us or specifically for us. We use JJ KT88 and Russian New old stock 6H1N as a driver and input tubes.